Dr Matthew Laugharne obtained and Honours Degree in Medicine from the University of Bristol with an intercalated First Class Degree in Molecular and Cellular Pathology. He obtained his Membership of the Royal College of Surgeons (London) before training in Radiology at the Severn School of Radiology and obtaining his Fellowship from the Royal College of Radiologists. Matthew obtained specialist training in paediatric radiology at the Bristol Royal Hospital for Children and abdominal imaging at the Bristol Royal Infirmary and North Bristol. Matthew’s major clinical interests are in imaging children of all ages, using a wide variety of radiological modalities. 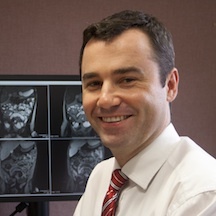 His other interests include gastrointestinal imaging with particular emphasis on MRI and liver imaging. Matthew performs a number of interventional procedures and oncology cross-sectional imaging.